After 30 hours of traveling my plane finally landed in Kathmandu around 8:30 at night. 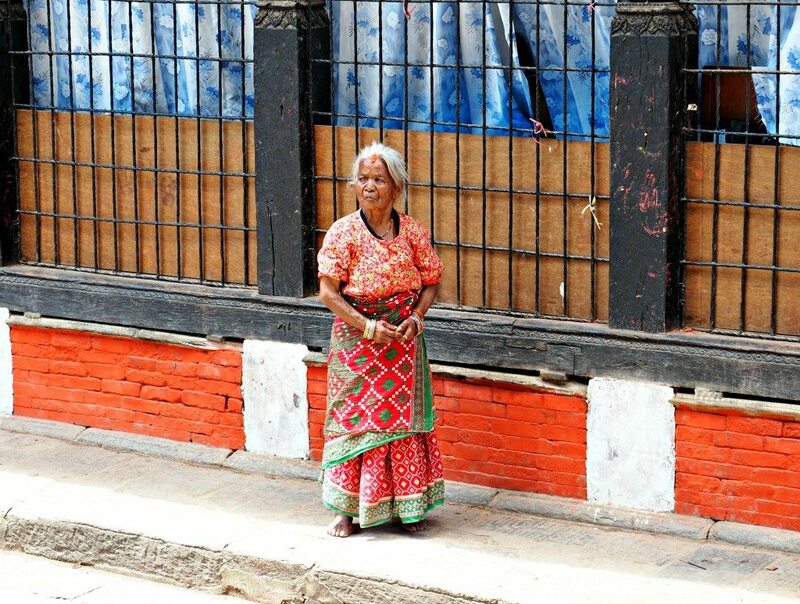 Deliriously I got off the plane, stepping into the quiet Nepalese immigration. I was greeted with kind faces and a customs without any power. I waited in the dark to get my visa and go through customs before I hopped in a cab to drive to one of the nicer hotels in the city, the Shangri La Hotel. I sat in the back of the cab, while cars weaved in and out around each other with no hesitation or rules. Horns filled the streets as I sat in the back with my eyes closed, bracing for impact. My driver kept looked back at me laughing, asking where I was from. When I responded he replied with “America? Oh, very good place”. 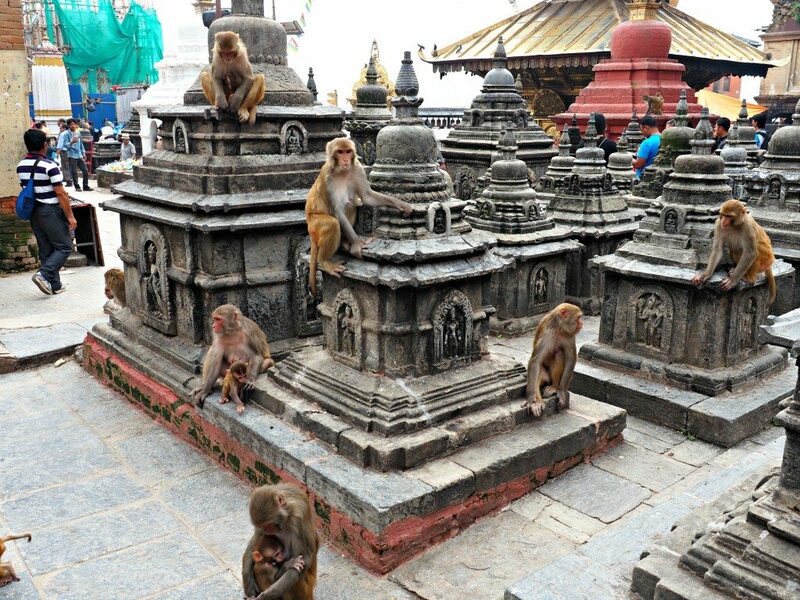 The next morning I woke up and headed to the famous monkey temple located high in the hills called Swayambhunath. 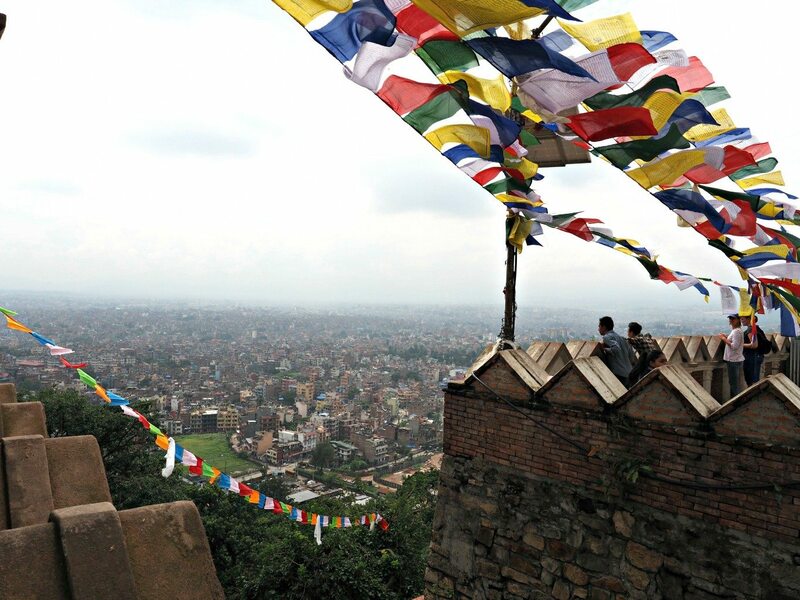 I walked up the steep stairs lined with colorful prayer flags and white washed stupas until I reached the top. The views of Kathmandu below were breathtaking and I stood there just taking it all in, my first ever solo vacation has begun. 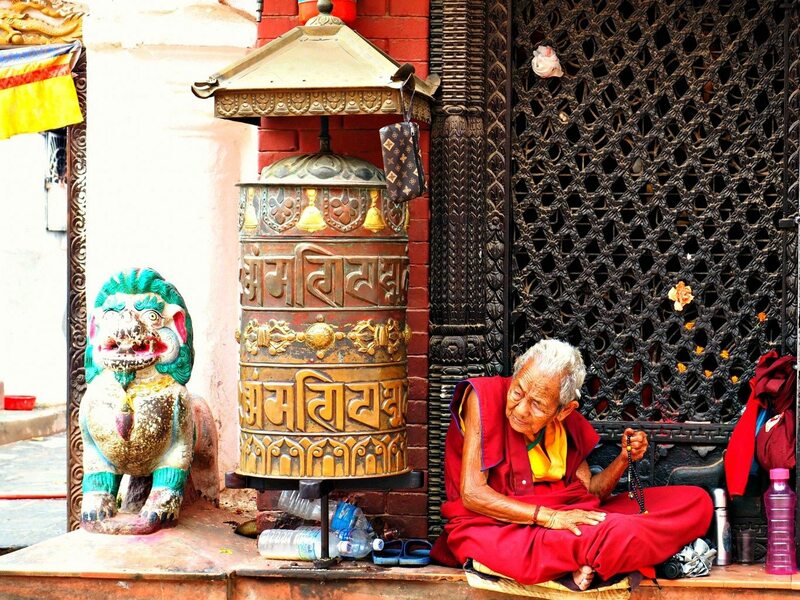 The smell of incense filled the air as I walked along the beautiful temples, touching the prayer wheels like the locals, and walking clockwise around the large gold stupa. There were people all around, praying at the beautiful temples and I watched them as I walked around making sure to dodge any monkeys coming my way. I knew right away I was going to love this place. 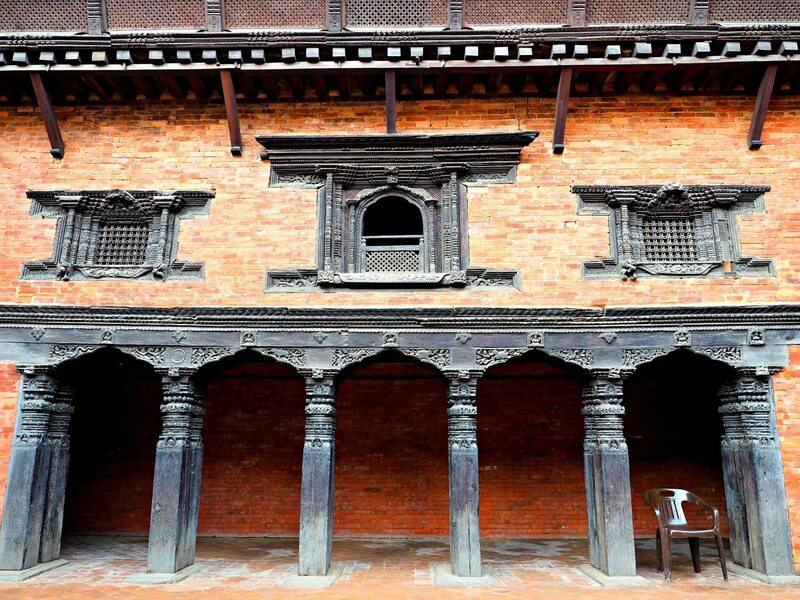 My next stop was to Patan Durbar Square which is located in the center of the Lalitpur area of Kathmandu. It is one of the three famous squares and a UNESCO World Heritage Site. 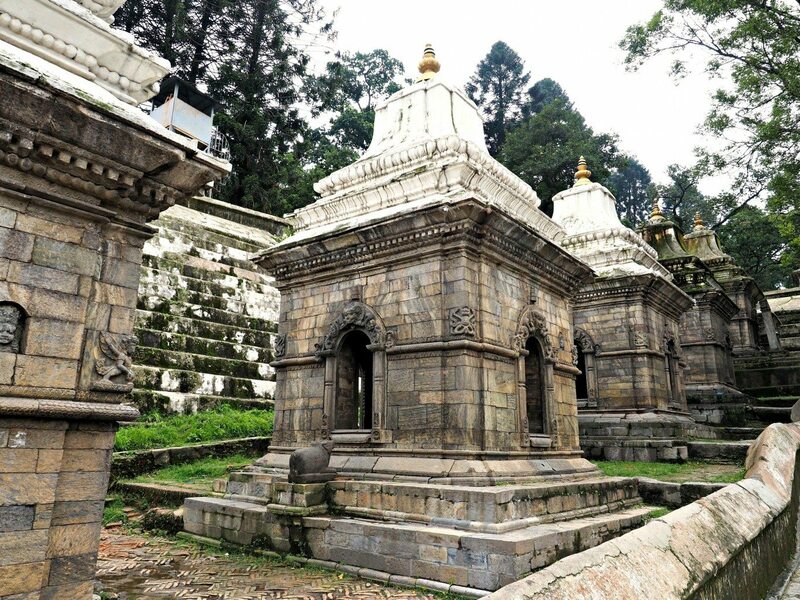 There were remnants of the destruction from the 2015 earthquake that shattered Nepal but overall the Square was in pristine condition and I was more than eager to explore. 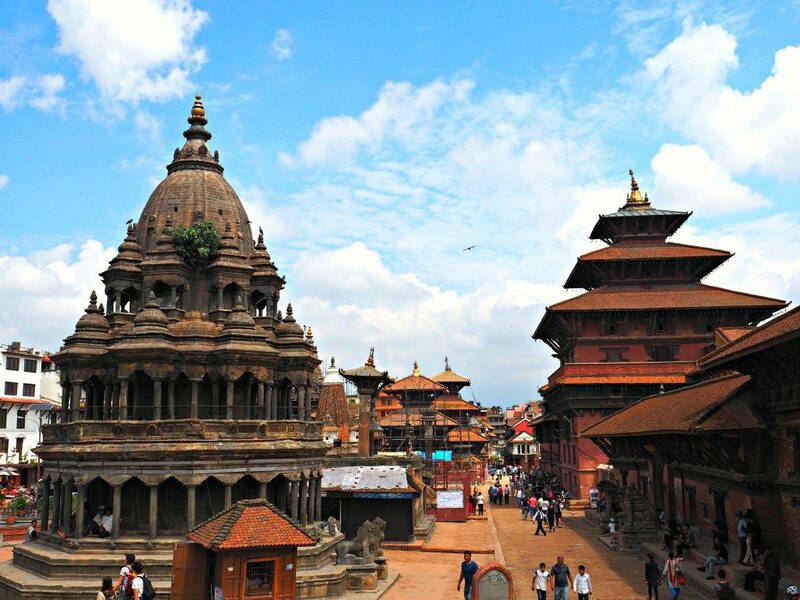 I walked all around exploring the small side streets, ducking into temples to be blessed with the Tikka on my forehead, and checking out the amazing architecture that surrounded the square. Beautifully hand carved doors and windows were present in every building around the square and I couldn’t help but just stop and stare at the intricacy and imagine how long it took for someone to construct such a building. Coming from a world where “handmade” doesn’t really exists anymore, especially for buildings, it was mesmerizing. 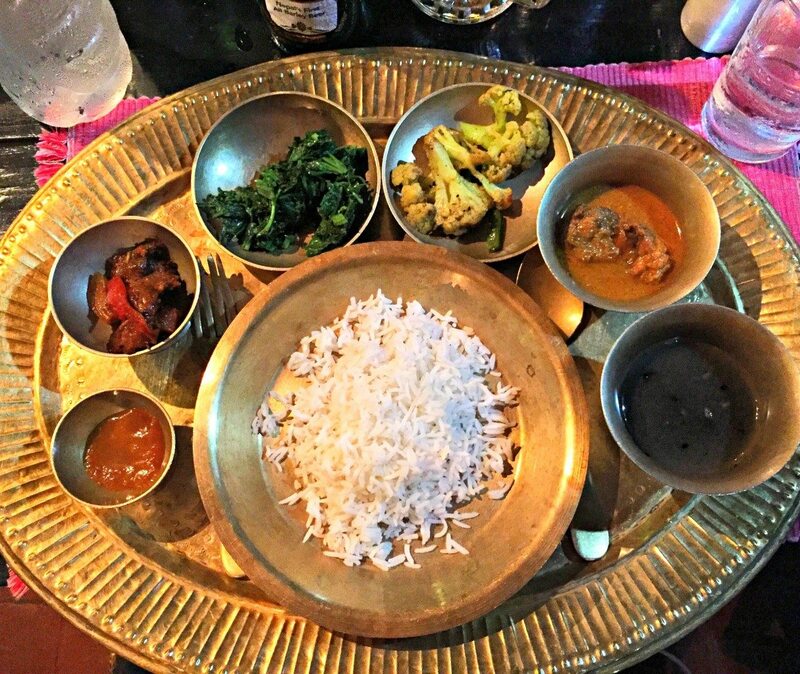 I ducked into a small garden restaurant where I got my first taste of Nepalese cuisine…. Momo. 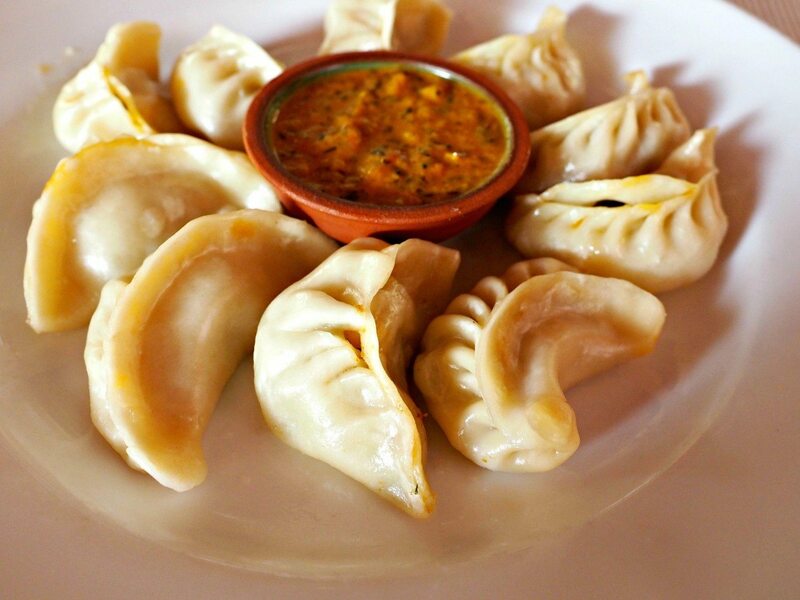 Momo are steamed dumplings, filled with either chicken, vegetables, or water buffalo (OMG), with a slightly thicker dough than you’d find in other asian dumplings. They pair them with a spicy curry tomato sauce and oh. my. goodness. they are SO good. I couldn’t stop eating them. After washing them down with my cold Everest Beer I was beside my self with pure happiness. The next morning I found out there was a holy festival going on in the city called the Teej Festival. 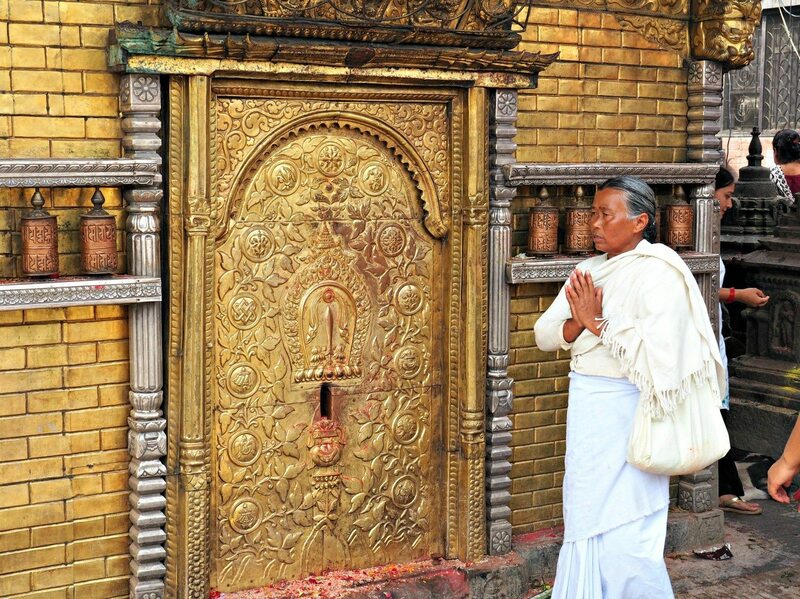 This festival is where all of the women wake up really early in the morning, dress in their finest red attire, fast all day long, and go to the Pashupatinath Temple to pray. The younger single women pray for a good husband while the married women pray for their husband to be the best they can be. 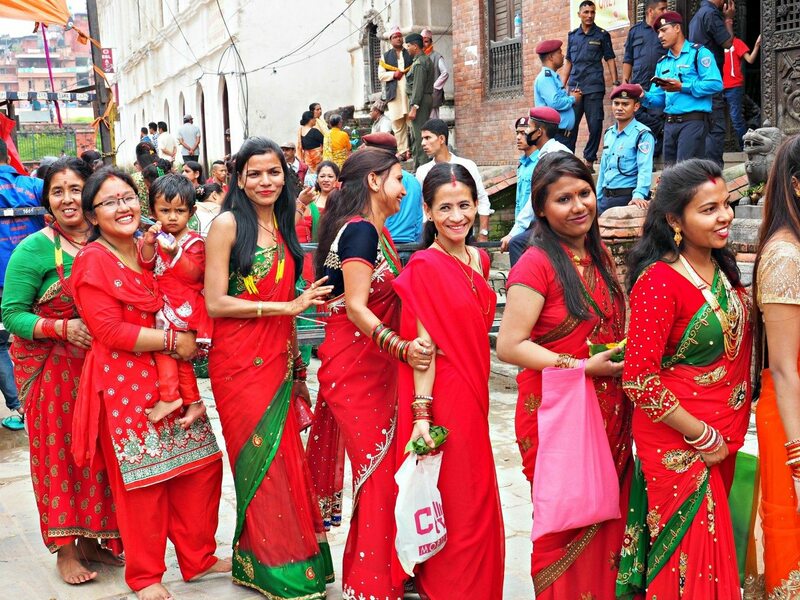 It’s a vibrant, colorful festival and I couldn’t wait to see the women. As I was driving there there the line of women in red seemed to be never ending . I couldn’t believe about many women were standing there waiting. The line had to have taken 5-6 hours to get to the actual temple itself. Lucky for me, I’m a tourist, and I could go in another entrance and not have to wait in line for 6 hours. I walked towards the temple in a sea of beautiful Nepalese women dressed in red. I stopped to receive a Tikka blessing on my forehead before I started taking pictures. I couldn’t stop and they didn’t want me to. They were all so beautiful. 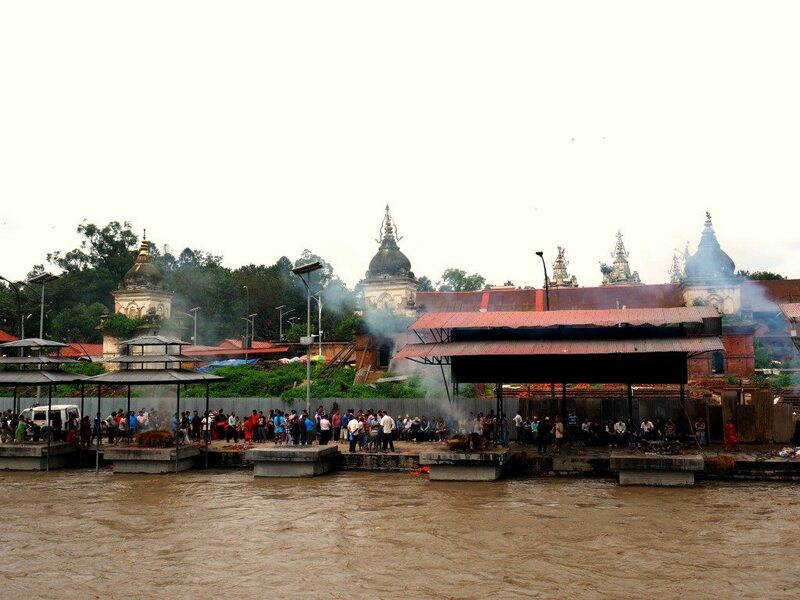 I walked to the other side of the temple where I passed the river where cremations were being held on the bank. The smoke filled the air and I couldn’t help but feel a little queezy knowing that I was breathing in the smoke from four nearby cremations. 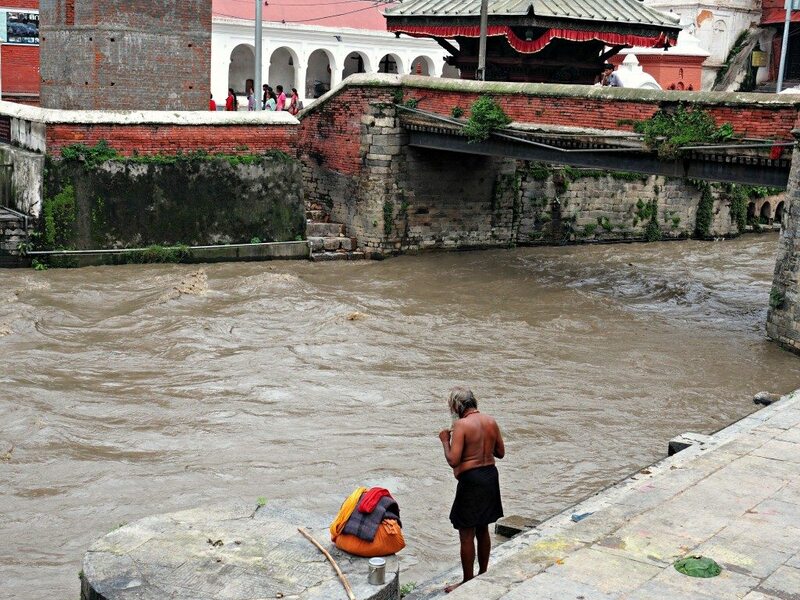 I glanced down to the riverbank and watched a man washing himself in the river, completely unaffected that he was washing in the same river the ashes were being put into. It’s always an eye opening experience witnessing a different culture and their faith about the afterlife. I found there was a much better understanding of life and death here and how they perceive what our body is, just a vessel for our soul. I walked up the stairs and past the moss covered old shrines until I came across something so amazing: a group of Sadhus. A Sadhu is a holy man in Hinduism that has dedicated their life to meditation and contemplation. They wear brightly colored clothes signifying their Holy status, and you’re instantly captivated by them. I sat next to them as they talked to me, giving me a blessing, wishing me a life of happiness, love, and prosperity. I wanted to sit there all day with them, but I continued on. 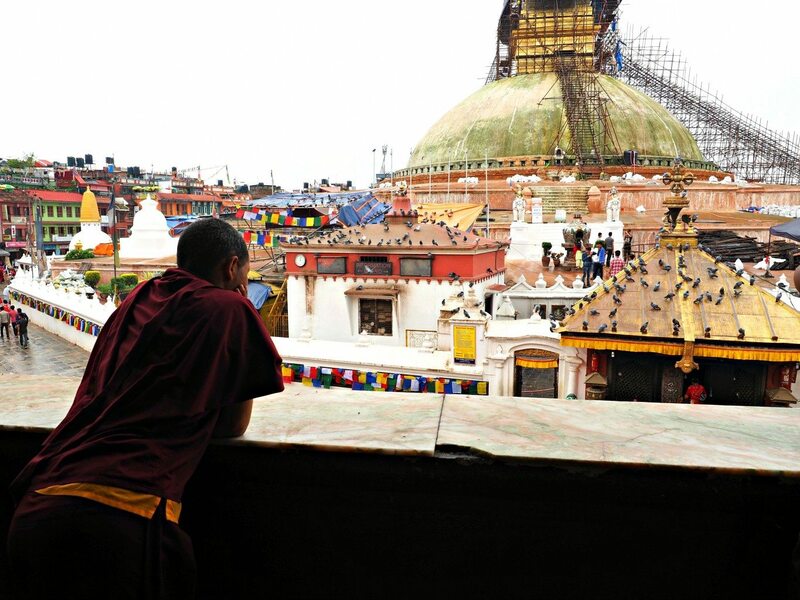 I made my way to the Boudhanath Stupa located in the city center of Kathmandu which is the largest of all the stupas and the holiest. 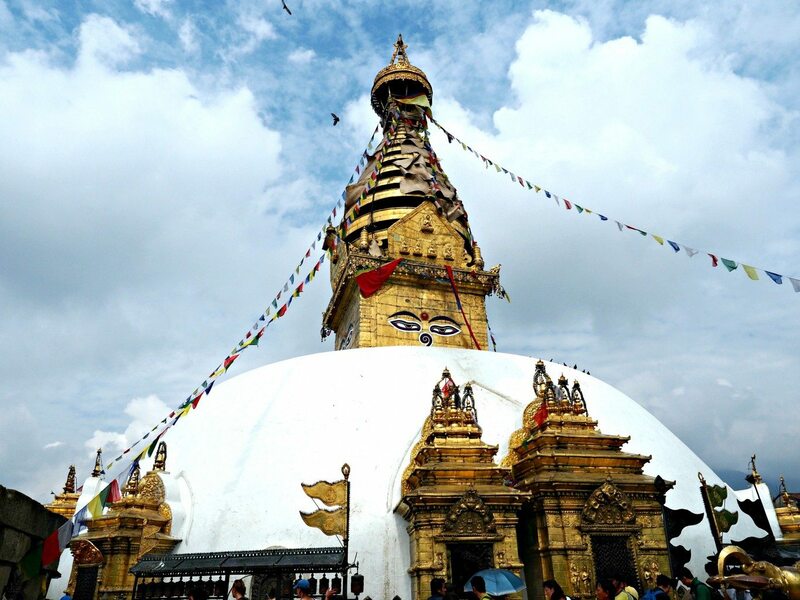 Unfortunately there were significant damages done to this beautiful stupa from the earthquake and as I walked around I watched as volunteers worked diligently scaling up and down the precarious bamboo ladders trying to restore it to it’s former glory. 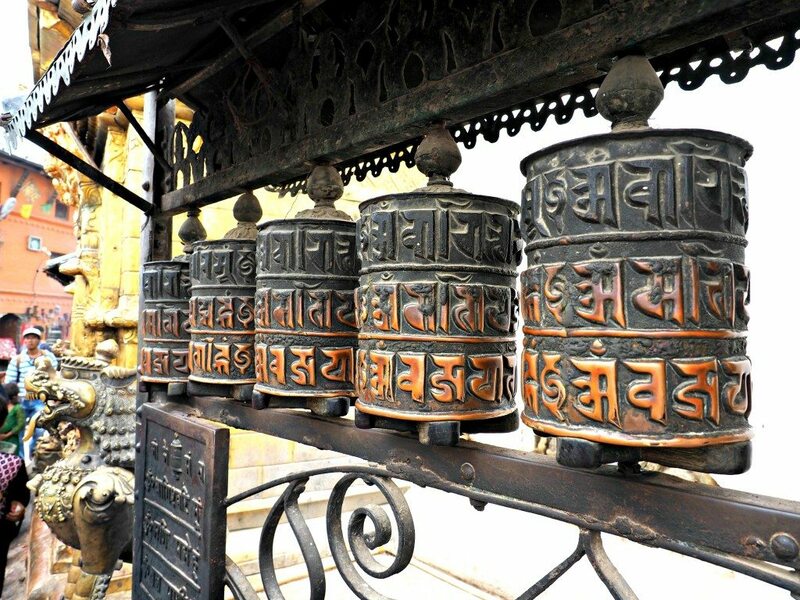 I walked around the stupa clockwise like the monks were, touching the prayer wheels the whole way and observing the sweet Nepalese people around me. That night I feasted on a traditional Nepalese dish: Dal Bhat. This is a dish that is served almost every night at home in Nepal and the name literally translates to exactly what it is: Dal = lentils and Bhat = rice. The lentils and rice are always the same, but what else accompanies it changes. Usually it’s sauteed curried vegetables, some kind of curried meat, Nepalese “pickles”, and greens all served in their own small silver bowls so you can add them to your rice as you’d like. I ate my weight in delicious Dal Bhat, piling on the incredibly flavorful curried wild boar and curried squash. The next morning I woke up at 5 am and headed to the airport. 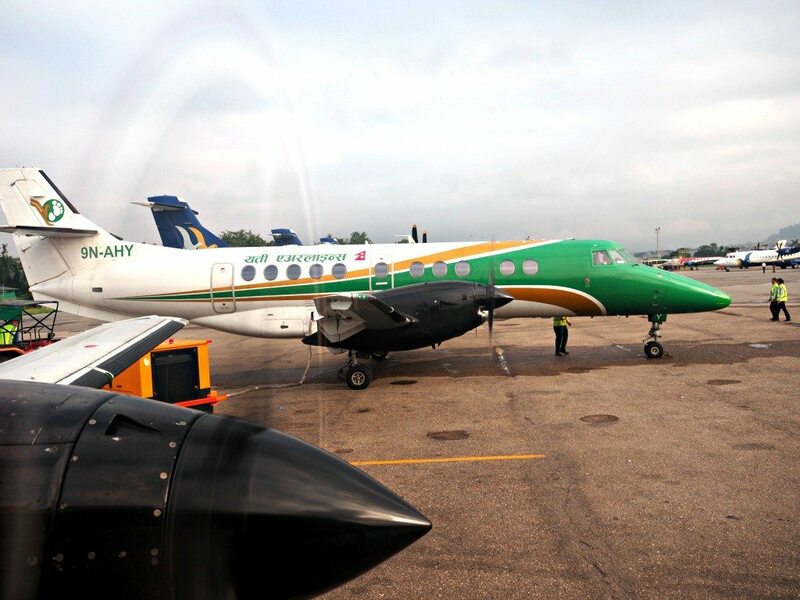 Today I was going to take a scenic flight on Yeti Airlines to see Mount Everest and the majestic Himalayan Mountains. I patiently waited in the small domestic terminal until the airline got the go-ahead for clear weather. We ascended through the clouds and in twenty minutes I saw one of the most beautiful sights of my life. 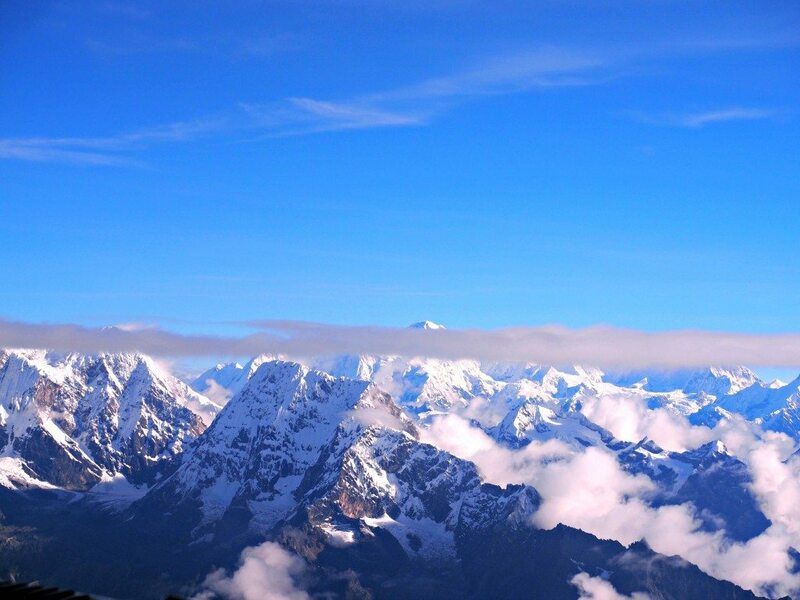 The color blue didn’t seem real, the snow capped mountains didn’t seem real, and the fact I was looking at them with my own eyes didn’t seem real. 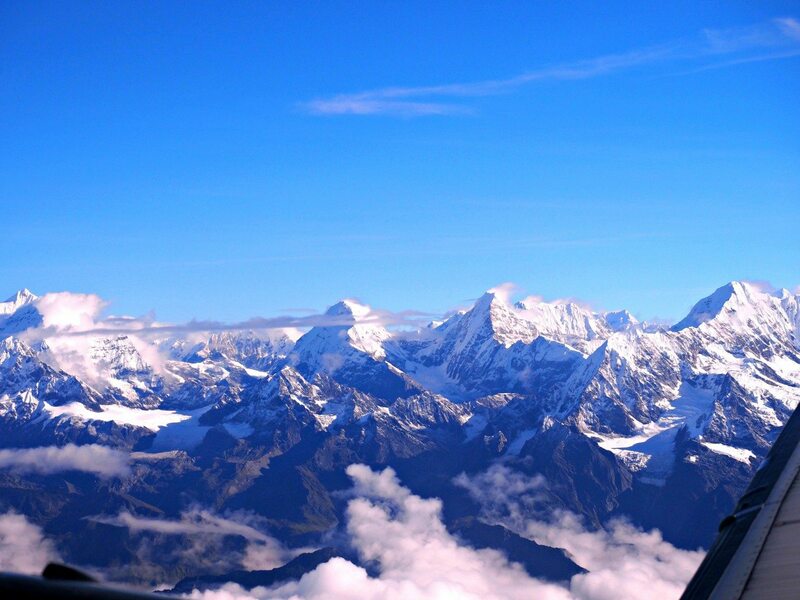 I sat there speechless while we flew next to Mount Everest. It was a surreal experience. 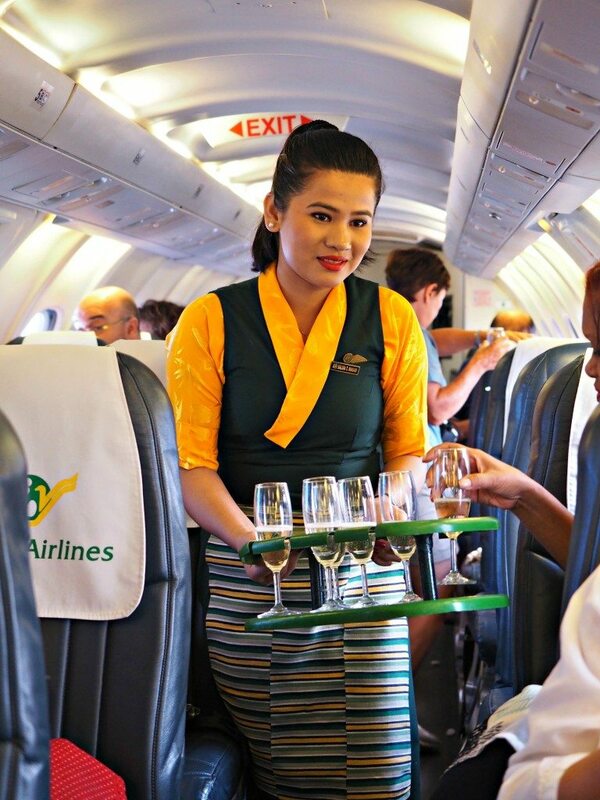 We were all given a glass of champagne and my new friends and I toasted to the Himalayan Mountains as we headed back to the airport. My trip continued from here, seeing the rest of this beautiful country, for the next two weeks. I fell in love with the culture, the people, and the food. 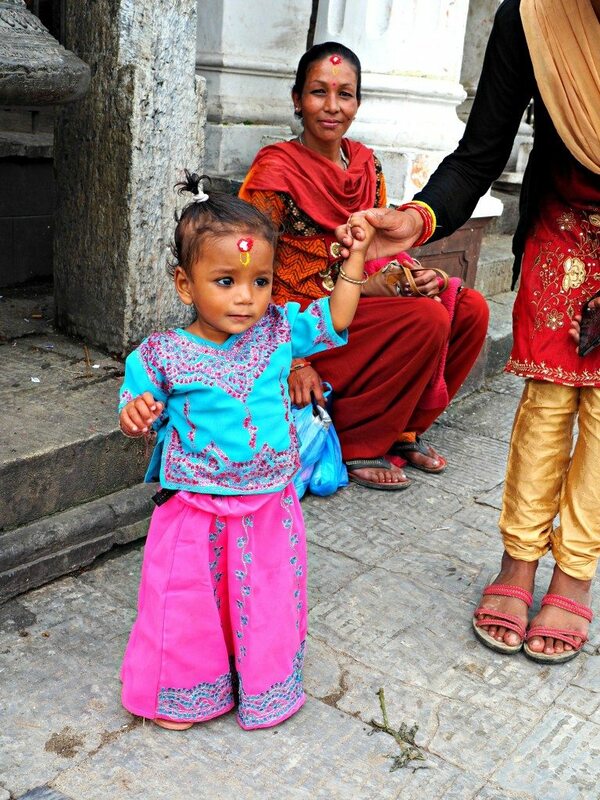 Despite Kathmandu being so large and chaotic, I found beauty in the chaos. The cars and their crazy driving towards the end didn’t even bother me… in fact I got used to it and started to like it. Everyone was so present in the moment that there were hardly any accidents ever. People were so kind to me in this great city that I was hungry to see the rest of the country. Kathmandu was an amazing place, and one that I hope to return to one day, if I’m lucky. 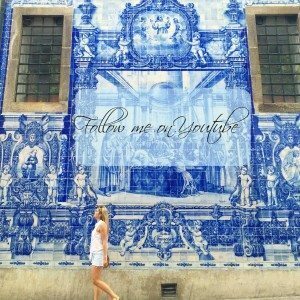 Every travel was explained so beautifully I felt as if I has been on the tour.WONDERFUL!! !